We are discreet and provide a customised service to all parties. We can respond quickly, and you don't need to worry about language barriers. We take the time to understand your products and services before introducing you to our partners around the world and then develop a tailored solution. You will always deal with the decision-maker. We will get back to you quickly to tell you clearly whether we can help you. 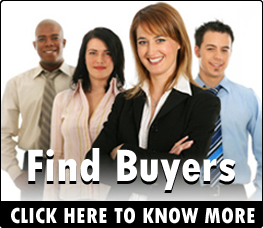 We can find Global buyers for you. We connect you with serious buyers only. We can advise you on pricing and global trends. You don't need to worry about B2B sites and others, we will handle all. We will be appointing a dedicated staff at our office, working for you only. We can offer you 30-days trial.